Released on 30th January of 2012. Atomhenge, the home of the Hawkwind catalogue of 1976 – 1997 announce the release of a newly remastered edition of the classic 1993 album “IT IS THE BUSINESS OF THE FUTURE TO BE DANGEROUS”. Released in November 1993, the album was a journey in a new direction for the band, seeing them embrace the emerging Ambient music movement (which had taken inspiration from Hawkwind’s earlier work), creating a lengthy album of experimental music in the distinctive Hawkwind style. 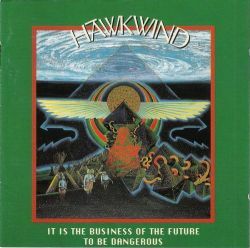 Featuring outstanding tracks such as “Space is Their (Palestine)”, “The Camera That Could Lie” and the album’s title track, “IT IS THE BUSINESS OF THE FUTURE…” brought Hawkwind to a new audience and gained critical acclaim. This ATOMHENGE reissue features a new essay and restores the original album artwork. It has been expanded to include the track “GIMMIE SHELTER”, recorded with SAMANTHA FOX for the charity album “PUTTING OUR HOUSE IN ORDER” and also includes a BONUS CD comprising the rare 1993 EP’s “THE SOLSTICE REMIXES” (featuring mixes by ASTRALASIA) and the “DECIDE YOUR FUTURE” EP.